“Come on, I’ll walk you up,” he said. He reached down to take from her hand the key she had fished out of her pocket. For the second time that evening, she was at a loss for words. The previous times he had walked her home, he’d been content with saying good-bye to her outside. Escorting her upstairs made the evening more intimate, more than just two friends hanging out. It made her wonder what he expected from her after he’d paid for her admission into the Savoy and for dinner. Outside her apartment, Cass waited as Randy unlocked the door. Once the cylinder clicked, she reached for the key. His hand closed over hers as he stared down at her. “Shh,” he whispered as he caressed her cheek with the back of his free hand. He was standing so close to her, she swore she heard his heartbeat. Or was that her heart? She was not sure whose heart it was, only that it was beating faster with every passing second. His hand slipped from her cheek and hooked under her chin. He raised her face as he leaned down. Randy’s other hand slid around her waist. He pulled her closer to him. The pressure of his lips on hers sent chills through her. She forgot her worries and enjoyed the kiss. She actually felt safe and comfortable with him, something she’d never expected to feel with a man. She wanted the feeling to last. Then she felt the twitch on her hip. His growing hardness set off warning bells in her head. With a gasp, she pulled her head back. “I knew something wasn’t right with the kiss you gave me on New Year’s,” he said. “What was that?” Cass asked. “It was too short.” He leaned forward again, but she put her hands against his chest and turned her head. “What’s wrong?” he asked as he released her and took a step back. He stared at her, confusion on his face. “I have to go,” she said, before slipping into her apartment. “Cass—” was all he had a chance to say before she closed the door in his face. 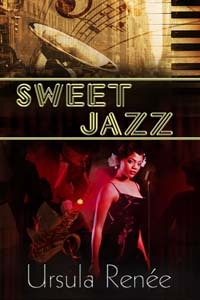 SWEET JAZZ SUMMARY: The Big House's “Coloreds Only” policy makes the club popular with Harlem residents. The same policy makes it harder for the owners to find and retain musicians. After four weeks of listening to saxophonists with bigger dreams than talent, the owners are ready to hire the first person who walks in and plays “one good note.” Their words come back to haunt them when Randy Jones auditions. Many of the employees are not thrilled when Randy breaks the color barrier. He does find an ally in Cass, the club's sassy singer, who goes out of her way to welcome him. Offstage, Cass Porter looks like a teenager, but when she sings she’s all woman. Inside, she’s been hurt badly and has determined never to love again. As their relationship develops, life at the club for Randy becomes complicated when he has to fight both Cass’s fear of opening her heart and those who want to keep them apart. ABOUT THE AUTHOR: Ursula Renée writes historical romances and suspense. When she is not writing, Ursula enjoys drawing, photography, and stone carving. She is a PRO member of Romance Writers of America (RWA) and President of the Romance Writers of America / New York City Chapter. She is also member of Mystery Writers of America (MWA) and Sisters in Crime (SinC). To enter the When Sparks Fly Contest, click here or visit www.rwanyc.com.